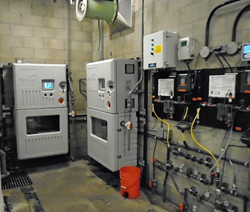 Parkson's MaximOS™ on-site water disinfection technology replaces aging system in Riverside, California, offers unique and advanced design features. Parkson, in partnership with Superior Water Technologies in Irvine, California, recently installed its MaximOS™ on-site water disinfection technology in Riverside, California, to replace an aging system that had become largely inefficient. The city is within the Western Municipal Water District, an area hard hit by drought and keenly aware of the need to provide safe, reliable drinking water to its customers. However, the benefits of MaximOS go far beyond cost effectiveness. It features a green technology that disinfects water using only salt, water and electricity to create a highly effective disinfection solution that is produced and stored in low concentrated form. MaximOS also positively impacts Western Municipal’s operation and maintenance of on-site generation in ways that the public may not know. For instance, the equipment eliminates the need to purchase, transport and store dangerous chemicals. It reduces carbon emissions and fuel consumption, minimizes operator interaction, and takes up less floor space than conventional systems. MaximOS doesn’t even require a transformer. “It took less than two weeks for Superior Water to change out the existing OSG system in Riverside,” says John Deogracias, Commercial Leader of MaximOS, “and now that it’s operational, the district’s daily maintenance needs have reduced dramatically." For more information on MaximOS, please contact a local Parkson Sales Representative or Parkson directly at 1-888-PARKSON. You can also visit us on the web at http://www.parkson.com/maximos. Parkson is a supplier of equipment and solutions for potable water, process water, and industrial and municipal wastewater applications. Founded in 1960, Parkson has been owned by Axel Johnson Inc., since 1967. Parkson designs, engineers and assembles products that provide customers with advanced screening, biological, filtration, biosolids and disinfection solutions. Parkson also has a highly trained field service team capable of completely rebuilding aging equipment or retrofitting equipment to include the latest technology advancements.